The Syrian Arab Army (SAA) and the National Defense Forces (NDF) have finished their combing operation in the central Syrian desert, the NDF media center said in a statement. According to the released statement, the SAA and the NDF eliminated several ISIS members and seized loads of weapons and equipment in the framework of the operation, which covered desert areas of Homs, Rif Dimashq, Deir Ezzor and Raqqa provinces. Despite this, ISIS cells still control a large chunk of the Homs-Deir Ezzor desert. On February 21, a car bomb exploded near the Deir Rasm hospital in the center of the Turkish-occupied city of Afrin injuring up to 10 people. The attack took place a few hours after a military parade held by Turkish-backed militants in the city. Opposition activists accused YPG-linked rebels of carrying out the attack. Since early 2018, YPG-linked cells had conducted multiple IED attacks and ambushes on positions of Turkey-led forces in the region. A car bomb hit a bus currying workers returning from the Omar oil fields. At least 15 people were killed and multiple others were injured. No group has claimed responsibility for the attack, but local sources say that it was likely conducted by ISIS cells. Multiple convoys carrying men, women and children, mostly ISIS members and their families, left the ISIS-held pocket in the Euphrates Valley in the last 2 days. These persons are being transferred to filtration camps controlled by the Syrian Democratic Forces (SDF). According to reports, about 250 ISIS fighters remained besieged in the area because they refuse to surrender. It is interesting to note that pro-SDF sources pretend that the group allows civilians only to leave the pocket. However, evidence from the ground contradicts to these claims. On February 21, it appeared that the US-backed group had handed over 500 ISIS members to the Iraqi military. On February 19, Russian forces opened two humanitarian corridors allowing refugees to leave the camp. Members of the Syrian Arab Red Crescent were stationed at the checkpoints to provide medical aid to refugees leaving the camp. However, according to the Russian Reconciliation Centre, militants have blocked the exit from the camp by building an earth berm. They also threatened the refugees with “jail and death” on the territory under the control of the Damascus government. Head of the Centre Sergei Solomatin added that at the same time, “the possibility of exit of foreign fighters from the 55-kilometer zone to Jordan and Iraq is not limited” and ISIS militants and their families are being moved to the camp from the eastern bank of the Euphrates River. From its side, US-backed militants continue to repeat that the Damascus government is persecuting and punishing refugees returning to their homes. 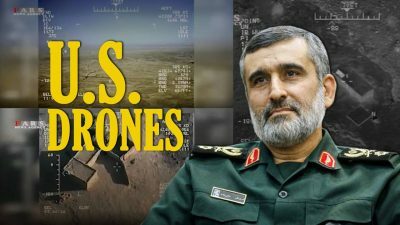 The Iranian Revolution Guards Corps (IRGC) have got control of 7-8 US unnamed aerial vehicles operating in Syria and Iraq, IRGC Aerospace Force Brigadier General Amir Ali Hajizadeh said adding that the IRGC extorted intelligence data from the aircraft. The IRGC media also released videos confirming its claims. While ISIS is de-facto defeated in Syria and Iraq, a possible escalation of the long-standing conflict between the US-Israeli-led bloc and Iran continues to pose a threat to regional security.